Natural gas spot prices at the Sumas trading point on the Canada-Washington border averaged $161.33 per million British thermal units (MMBtu) on Friday, March 1, the highest daily spot price recorded by Natural Gas Intelligence anywhere in the United States in at least five years. The price spike was caused by regional supply constraints and unseasonably cold temperatures. Limited supply coincided with unusually high demand when part of the polar vortex moved into the region during the beginning of March. Temperatures in Washington state averaged 33 degrees Fahrenheit (°F) from March 1 through March 4, 10°F lower than normal. These temperatures led to high heating demand in the Pacific Northwest and neighboring areas of the Rockies and Western Canada, regions that supply the Pacific Northwest with natural gas. 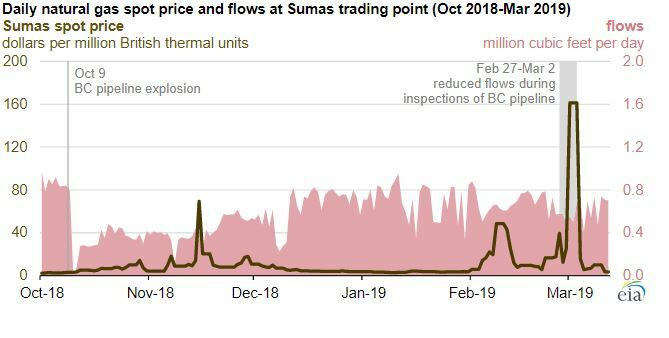 The October 2018 explosion on Enbridge’s BC Pipeline—which transports natural gas through British Columbia, Canada, into the United States at Sumas, Washington—led to reduced flows and higher prices at the Sumas trading point throughout the 2018–2019 winter. From November through February, Genscape data show daily flow through Sumas onto Williams’s Northwest Pipeline in Washington averaged about 610 million cubic feet per day (MMcf/d), about one-third lower than the same period in the previous year. 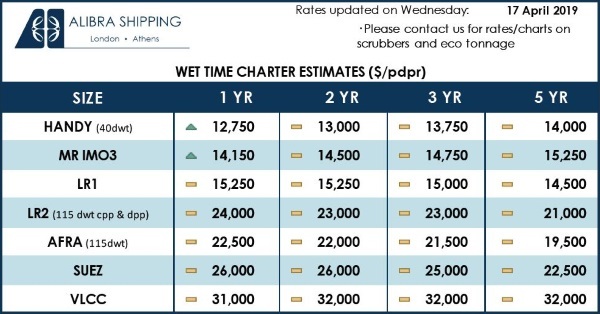 Sumas prices averaged $10.56/MMBtu during that period compared with $2.62/MMBtu a year earlier. 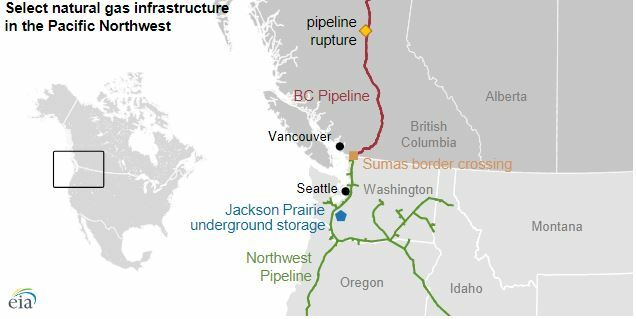 Throughout the winter, natural gas supply shortfalls in the Pacific Northwest were met by withdrawing natural gas from the Jackson Prairie storage facility in southwest Washington and by changing regional pipeline flows to bring additional natural gas into Washington and Oregon. However, around February 9, compression problems at the Jackson Prairie facility reduced the rate that natural gas could be withdrawn from the storage facility from 690 MMcf/d to 460 MMcf/d. Natural gas storage withdrawal rates decrease as natural gas is withdrawn from storage caverns, reducing the internal pressure and consequently the rate of withdrawal. As a result, the maximum withdrawal rate from Jackson Prairie would have been even lower than 460 MMcf/d by the beginning of March. Another factor affecting prices in this period was that the BC pipeline was expected to operate at reduced capacity during inspections related to the October explosion. These inspections were scheduled from February 27 through March 6, 2019. 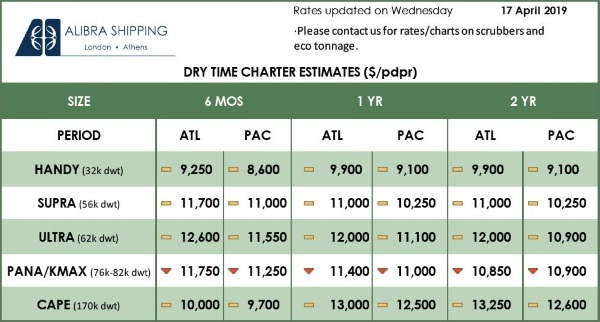 On Friday, March 1, 2019, spot prices for the weekend (which are negotiated during the Friday trade day) were set with the expectations that pipeline capacity reductions would last through the following Wednesday, March 6. Natural gas prices spiked to $161/MMBtu on Friday, March 1, ten times what they were on the previous Friday. After the BC Pipeline inspections ended early, on Saturday, March 2, and temperatures began to increase, Sumas prices fell to $15.63/MMBtu on Monday, March 4. Maintenance at the Jackson Prairie storage facility was completed by March 7, and since March 8, Sumas prices have averaged less than $4/MMBtu.